Would you like frosting with your slug? 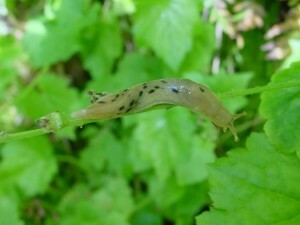 Slug is a term used for shell-less gastropods (stomach foots). The sea slugs are remarkably diverse, ornate and favorites of beach combers and divers. Then there’s the oft maligned land slugs… I pulled a board off the ground this weekend as saw a dozen small slugs, probably of two difference species, both introduced and all probably waiting to mow down whatever I might plant in the garden. But then I found a banana slug nearby. Who could malign a banana slug? Naturally, I had to show my kids. It sat in my hand for a moment before one optical tentacle slowly peaked out, then another, then its sensory tentacles… Left a heck of a slimy, sticky mess on my hand. Cool banana slugs reminds me of a recent story that involved two sea-through land slugs, an engaged citizen and a University of Washington scientist. It’s an absolute treat to scientists when interesting creatures or images are brought to our attention. Please share your observations. I’d love to include some in this blog. Oh right, aquatic things… The other reason I had slugs on the brain is that we encountered two lovely creatures during a recent beach walk. One was the sea lemon (Anisodoris nobilis), a fruity-smelling sponge eater. The other and most striking was the frosted nudibranch (Dirona albolineata). It’s also called the white-lined Dirona (albo-lineata = white-lined). The white edges of its cerata (the frilly things on its body) are distinctive, while the body can be white to light orange or purple. The frosted nudibranch is a predator, crunching away on bryozoans and even small snails. It doesn’t eat anemones like some of its similarly frilly aeolid cousins and thus doesn’t incorporate the anemone’s stinging cells into its cerata. However, when threatened by a predator, it will readily shed its cerata and makes a run for safety. Serendipitously, this weekend my wife found a photo in a gallery with a frosted nudibranch front and center and a stunning opalescent nudibranch (Hermissenda crassicornis) in the background. 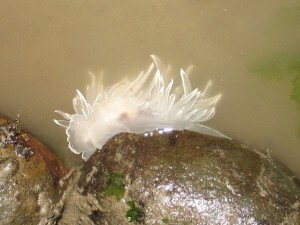 The label on the photograph said “Lion’s mane”, while the label for the lion’s mane jelly (three photos down) said “Redondo nudibranchs”. We quietly switched the labels. The opalescent is an aeolid with stinging cells in its cerata and is known to be voracious and cannibalistic. Maybe the photo’s title should be changed to “Killer in the shadows” or something similarly dramatic.